So you want to get the gang together for an end of the summer Labor Day party… but you don’t want to have all the expense that goes with it? “That’s OK!” It is not too late! A great way to get friends together without having to take on the whole tab is to a have a BYO party. You know a “Bring your Own.” All you have to do is turn on the grill and grab some paper plates, napkins and plastic ware. Send out an evite to your friends letting them know the grill will be hot by 2:00 so to come on over and help you end the summer in style. Does this make you look cheap? No, it makes you look reasonable. Friends like to get together but affording to sometimes just isn’t in the cards. 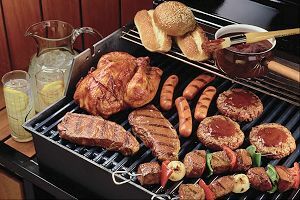 So by opening up your house and your grill you give friends the opportunity to come and celebrate; get out of their own homes for a little while; spend time with good company and not spend an arm and a leg doing so. You can even put up a net to play badminton or volleyball. Getting together with friends and family doesn’t have to be a big formal affair, sometimes people just need a reason to get together… so go ahead and give them one! ← A Hunger Games Alternate Ending Worthy of a Read!